Normal?? What is Normal?? Missionary Life is Anything But “Normal”!! We are HERE!!! It almost doesn’t seem real that we have moved to the Dominican Republic to start working with at risk kids affected by human trafficking, social poverty, spiritual poverty, economic poverty and an over all daily struggle to survive!! It has been three years almost exactly to the day of our calling that we arrived here. June 7th of 2012 we headed out on an adventure that would change our lives forever! Now, on June 3rd, 2015, we landed to start that journey that God has called us to. In that three year waiting period, Jeff served as Youth Pastor at Foothills Community Church, took multiple mission teams to the Dominican Republic, started our Transform365 Feeding Center Outreach, began raising our monthly and long term support to start the first cottage of the Rescue Base, a daily feeding program, supplemental education – helping children secure their legal paperwork so that they can enroll in public school then provide them with a meal and Christian schooling teaching them about Jesus!!! This is all on the prevention side of human trafficking. We will be ministering to boys and girls that are orphaned with no mom and dad, girls that become pregnant and have no where to go and no one to turn to because they have been kicked out of their homes, and those that will be rescued out of human trafficking providing counseling and restoration for the precious children. We will be working with all ages from birth to early 20’s providing a transition home for those who are older, but need that extra love and care. Let me warn you … this is a long one!! It has been awhile since we have sat down and talked!! If you get bored hearing about us, then you can drop to the bottom and read updates about the ministry! 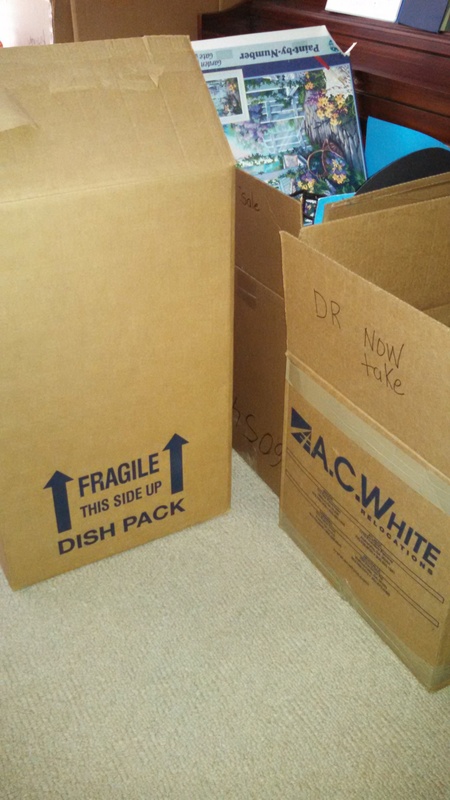 Now, let me bring you up to date on what’s been happening in our lives in the last two to three weeks that we have been preparing to move, moving, and getting settled in. Here is where the title fits!!! Normal!! What is normal?? I used to think there were “normal” people, “normal” situations, “normal” culture, “normal” behavior, but the older I’ve gotten all of that has gone out the window! I firmly believe now that NO ONE is “normal” and that nothing is “normal”. We are trying to get settled into a new culture with a new language and lots of people to meet and LOTS of thing to learn!!! We do feel out of place or frustrated at times! It’s a big change to have all of these things hitting you all at once. We are creatures of habit, are we not?? So we are adjusting and finding new habit! We LOVE the Dominican Republic and are getting settled into our new way of living! So here goes the wild ride that we have been on these past few weeks … Who says life with Jesus is boring? Not in the least!! Love it!!! Before leaving for the DR, we were feverishly packing, selling, storing, donating, raising final support, meeting with churches and individuals, Jeff speaking, trying to secure our 1 year visa in the DR, getting physicals, purchasing plane tickets, saying good byes to family and friends, having going away parties, spend the nights with the girls friends, celebrating twins birthday, and on the list goes, I must say a HUGE THANK YOU to all of our precious friends and family who self sacrificially gave of their time to help us pack, sell items, raise money, donate to the ministry, give gifts to us and to the Lord, do repairs and painting on our home, even spent the night with us to get the job done. As I type this I’m overwhelmingly reminded of what an incredible God we serve and what incredible people God has surrounded us with!!! I couldn’t even possibly name names as this blog would be super long and I don’t want to leave anyone out!!! Let’s just say, the list would be VERY long! Praise the Lord! We left on Wednesday, June 3rd, and Garry Barber and Darin Wise, pastor and worship pastor of our sending church, Foothills Community Church took us to the airport! 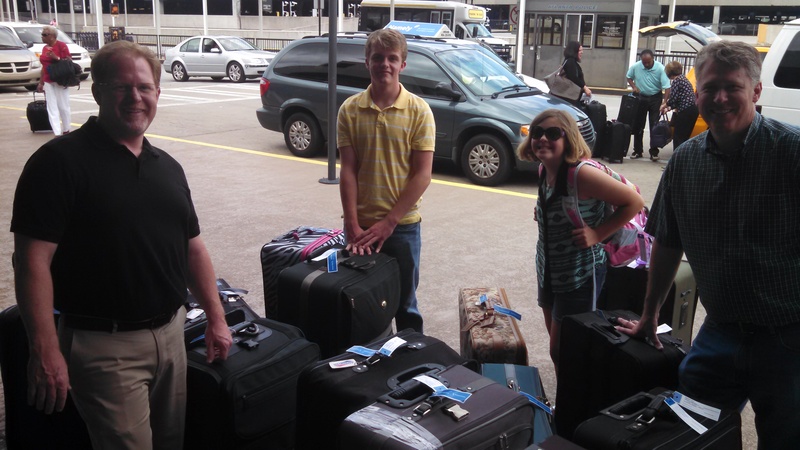 What a blessing to have transportation for us and all our suitcases. We had a wonderful friend, Liz Sencen and her girls show up to the house and bring us our last Chick-fil-A nuggets to enjoy on our way to the airport. Wow! So wish we could have a CFA here in the Dominican Republic! Maybe one day! Any takers on someone coming to help us get one started? By the way, there are NO Chick-fil-A’s outside of the United States. A lot of prayers on our part would need to go into CFA deciding to come to the DR. 🙂 It was cheaper for us to fly first class on American (which we have never done before – we were super excited) with our three suitcases per person than it was for us to fly coach an pay extra for our bags. So checking in our check in bags was a snap, THEN off to go through security. This started a chain of events that lasted for several days. 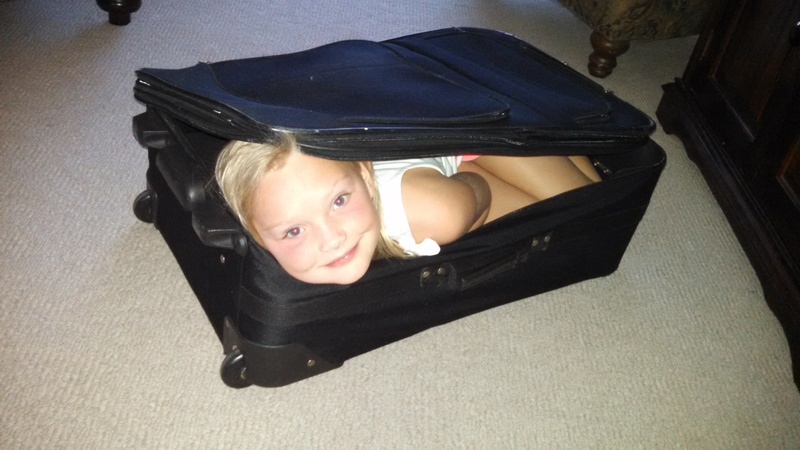 One of our girls, who will go unnamed, forgot and packed a pocket knife in their carry on! Oh, boy! Thankfully, they were sweet and allowed Jeff to take his carry on and go back to the beginning and check his bag in with the pocket knife inside. While he was standing there speaking with the airlines agent he noticed our flight was delayed and we would miss our connecting flight to Santiago in Miami. He inquired and the agent said no problem we will put you on a Delta flight, but you will have to fly coach. Ok! Ugh, no first class. We had some crying girls who were super excited about the experience. We made it to Miami and were planning on having CFA one last time. No CFA on our concourse! More tears! Then off to Santiago, back on our American flight flying first class! Yay! It was awesome! Boy, talk about being pampered. However, upon arrival to Santiago … there were no bags. We would not see our luggage for two days. The girls and I had our carry-ons packed with clothes (no toiletries), but remember how Jeff had to check on his bag, well, poor daddy had to wear the same dirty clothes until Friday. When we received our luggage there were 4-5 suitcases with extensive damage. We are now a day behind in our little vacay that we were trying to take before jumping in with both feet here getting moved in. After, taking inventory of all our things, we headed out to the beach for some R and R. For the first 3-4 days we had all kinds of crazy things happen … pool was green, Jessica got locked out of her room for a day and couldn’t get to her clothes or bed, oven didn’t work ( we bought groceries so I could cook and save money), but we God brought some new friends into our lives through all of this Donna, Bill, and Manny, missionaries from Canada working with Haitians in a Batey here in the DR! Wow! They were a God send and took care of us all along the way. We even got to have dinner with them one evening. So much fun! We have had some more bumps in the road since being here, but through every bump (just normal DR stuff – no power, no water, HEAT – but no A/C, fans, or water, when the power is out to deal with the heat! I was fine, just the rest of my family was about to pass out! Lol! Not fun having no water though when you are stinky, sweaty, and dirty after having no power and moving in. But we felt that was God ordained as well! 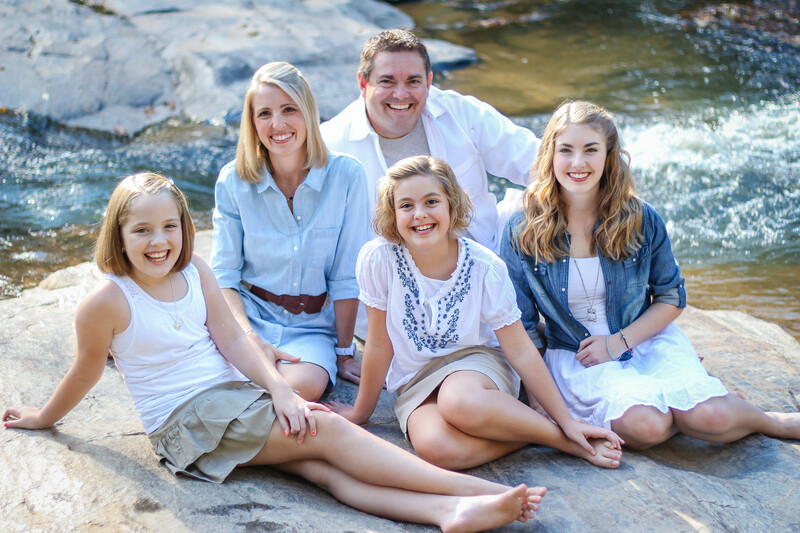 God just wanted us to get together with another missionary family, The Webb’s – the family that we stayed in their house last summer while we were down here. They had us over for showers and home made cookies. Good God centered conversation, food, and showers – you can’t get any better than that! (God actually provided two families to come to our aid for showers – Luis and Loida – on our team here in the Dominican – thank you to ya’ll for offering so graciously as well!) So even though we have had a bit of a bumpy landing, God has been with us each step of the way! Watching His hand at work and how He puts the tapestry of life together is way more fun than doing it ourselves. He always creates a masterpiece! We experienced a miracle yesterday amongst our no power, no water, water valve that wouldn’t shut off issues … OUR SHIPMENT!! Yes! That’s right!! We are now officially moved in to the DR with all the items that we were planning on bringing with us! The miracle is that everything made it through customs. We were very nervous about our medical supplies that had been donated as the government could have charged us a huge tax on them or held them from us. So a BIG thank you to all those who donated those awesome medical supplies to us so that we can carry out our medical/dental clinics. Such a blessing! Also, a BIG thank you to George Harbor and Red Meador for driving a U-haul trailer down to Florida to Missionary Flights International so that all our items could be flown over. Thank you to the team that showed up at our house to load everything after we had already gone! Again, watching the hand of the Lord move among His children! 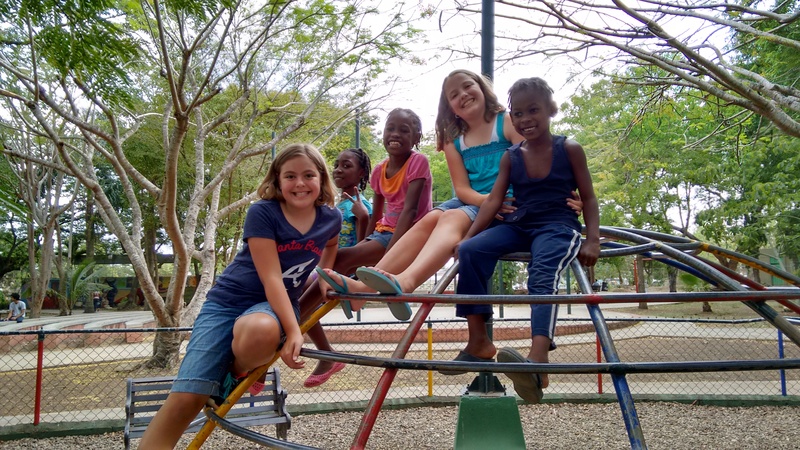 We also wanted to give you an update on the three girls and our Haitian friends here in the Dominican Rep. We have had an incredible reunion with our three precious girls, Benjina, Fransceca, and Darwine. They jumped into our arms and we hugged and kissed! Then we hugged, and hugged, and hugged some more! It was so much fun! We took them to the park this week, bought them some new underclothes, food items, tooth brushes and toothpaste, laundry detergent and now that our shipment is in we have clothes for them too! Woohoo! They are living currently with their dad and step-dad, Willie. We are working with him to help him get a job etc. HOWEVER! Here is the fly in the ointment and a huge prayer request – two days ago on June 18th, all Haitians are being sent back to Haiti. This is not a law that just applies to Haitians, but all foreigners. That is why we were scrambling at the last minute getting our visa to enter the country. 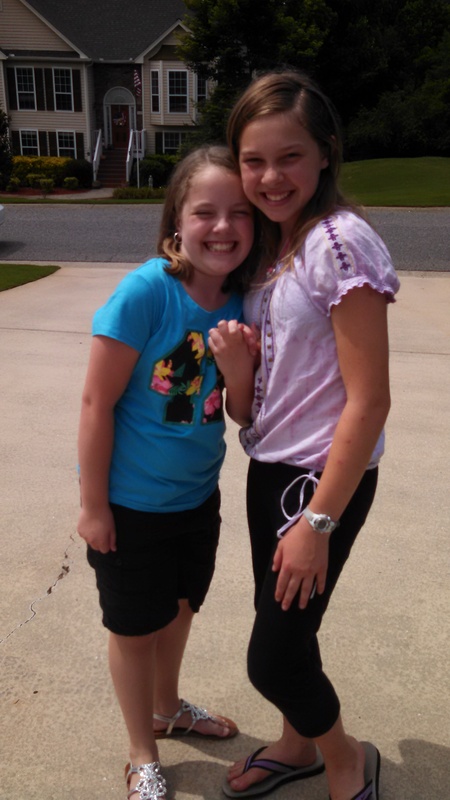 (That was a huge miracle that we were able to secure that so quickly – three weeks!) So most of our Haitian friends are living here I the DR illegally. The one that we are most concerned about is Benjina. She was not born here in the DR like her two sisters and also is over the age cut off for kids. She is a prime target to be sent back to Haiti. With no mom and only her step-dad to care for her who is here illegally as well, she could be sent back with no one to go to. Her birth certificate is in the process of being searched for in Haiti, but there are no papers to keep her here. Also, another great concern is our Haitian translator Casimir. He does not have his updated paper work right now either. His visa just expired, so keep him in your prayers also. 1-Please pray for us as we now begin the work that God has called us to! 3- Pray for our Haitian friends and kids that we are trying help with their paperwork so that they can stay here legally in the Dominican Republic! 4- Pray that Benjina does not get sent to Haiti and that we can find just the right people to speak with about this – it’s all in who you know. So pray that God directs our steps. I had a lot to say! It had been way too long since I’ve had a moment … more like 3 -4 hours in one sitting to write down these thoughts! My ticker says I’ve typed 2,051 words. If ya’ll have read all the way to the bottom of this blog … ya’ll are awesome! This is a long one!! Adios! Dios te bendiga! Good bye and God bless you! This entry was posted in Uncategorized on June 20, 2015 by wetransform365. You’re invited to enjoy a wonderful afternoon of fun, food, and fellowship as we send the Jones Family off to serve at-risk kids in the Dominican Republic. Let’s show our love by each providing a financial gift to assist them in furnishing the first cottage of the rescue base. There are so many needs when starting from scratch but when each person participates, they add together to make a great difference. As you enter the event, there will be a table where you can each participate by selecting a special item to give towards. Opportunities vary from covering the cost of silverware and bed linens up to bigger items such as a refrigerator and bunk beds. Any excess funds will be put towards the purchase of a van for the rescue base. The Jones Family is so excited to be able to serve the Lord in this way! They would love to see each one of you! Snacks and drinks will be provided during this floating shower celebration! If you are unable to attend and would like to provide a financial gift for the rescue base, please email Transform365 for giving instructions at wetransform365@gmail.com or call Crystal Casey at (404) 510-2109. This entry was posted in Uncategorized on May 5, 2015 by wetransform365. Love Will Find a Way!! I am Jessica Jones, the oldest of the three Jones girls. This week, I am writing the blog and will be giving you an update on the three Haitian girls pictured below, as well as where we stand for our support. I met Benjina, Francsesca, Darwine and Daniella, their mother, this summer. Darwine is the youngest, she immediately captured my heart and we became fast friends. Francsesca is the middle child, she and Judith Anne played together and then Benjina, the oldest, became good friends with Jami Jo. It worked out perfectly! We all had a friend to play with! A few weeks later, we met Daniella and found out about their living situation. All they had to their name was a 1 room cement floor shack with a tin roof – no food, no bed, no electricity, nothing. We helped them out with food but it only lasted a short time. Since our connection with them this summer, we have been praying for God to keep them safe. Recently, however, a terrible thing happened. The three girls’ mother, Daniella, died. We do not know for sure how she died but it seems that the symptoms point to a preventable cause. She could have been malnurished or had parasites (this alone could have killed her). She had severe stomach pain, was passing out, and had lost a lot of weight. Our heart breaks about the thought that if we had been there, we could have helped her. This just confirms the great need of someone being an advocate for these people. The Lord had other plans for Daniella, but we pray that from the time we arrive moving forward we can stand for those who cannot stand for themselves, showing them God’s love and salvation for their life. This leads us to the fact that we are ONLY 45 days out from leaving. We are so close, yet so far away. Ever feel like that before? Let me share with you what I have been up to and what I have to accomplish before we leave. I am currently meeting with colleges about dual enrollment and laying out my plan for the next 5 years. My dream college is Georgia Tech. I feel that the Lord wants me to get my Architectural Engineering degree from there. I will take the IOWA test this week. This whole month I have been going three times a week for SAT workshop classes in order to prepare for the SAT. I will be taking the SAT on Saturday, May 2nd. While I’m taking the SAT (my mom is still trying to figure out how to get me there) the rest of the family will be having a garage sale here at the house. Also, my momma has hired me to help with selling stuff from clothes to furniture. So between school, testing, picking a college, signing up for dual enrollment, sorting, packing, and selling, we are staying on our toes. Lol!! Can you help us help them? As we are coming down the home stretch and time to leave is closing in, we are looking for “finishers”. The first thing we need is your prayers. I know ya’ll are praying for us! We need this, the people we are going to minister to need this! We need a team of people to pray for us! The second thing we need is your love for the mission work God has put on our hearts. We have a deep passion placed there from the Lord and we hope that comes across as we share our hearts. The third thing we need is your financial partnership to be able to help these children out of poverty, distress, and deplorable situations. Most of these children are living on the streets or in the dump. They have nothing. That is one thing that we know we will have to do for Benjina, Franscesca, and Darwine is to secure birth certificates, purchase clothing, etc. We know that they have nothing. But with your help and God’s help, we can reach these children! All we ask is that you listen to God’s calling. If He is asking you to participate please do so, if not then give to those God is directing you to help! There are wonderful causes and needs all over this world including those who live right next door to us. We are all called to do something. How is God’s Spirit moving in your heart to join us in this great adventure? The Bible says in Luke 4:18, “The Spirit of the Lord is on me, because he has anointed me to proclaim good news to the poor. He has sent me to proclaim freedom for the prisoners and recovery of sight for the blind, to set the oppressed free”. Will you send us to the Dominican Republic? Our desire is to love on Dominican & Haitian children who desperately need to know the God of Heaven, the One who heals hurts & has a wonderful plan for their lives. But we can’t go unless we are sent…is God calling you to partner with us as a “finisher” and push across the end line and into Santiago by June 1st? Here is the information that my daddy has provided about making a difference in others’ lives! 5. Select “Jeff Jones” from drop down menu of missionaries. 7. Complete account set up. UPDATE – Before we could get this posted tonight, we heard from Luis Oscar, our Dominican staff leader who has been diligently searching for the girls in the past 48 hours. He was finally able to make contact with Wili, the father of the two younger girls. He has agreed to meet with Luis and we believe this will occur this Sunday, April 19th. Please pray for this conversation to result in what’s best for these 3 girls. Praise God we now know how to make contact!! That’s it! Thanks so much for your prayers, participation, and partnership to show that Love Will Find a Way! This entry was posted in Uncategorized on April 17, 2015 by wetransform365. So this is Jami Jo here, writing to all of you that might be interested in hearing what is going on with us!! We have already begun packing. Now, that involves a lot of sorting. We have boxes with categories written on each box. Here are our categories: Garage Sale box, On-line sell box, Trash box, Dominican Republic – Take Now box, Dominican Republic – Take Later box, and Storage box. We are doing lots of organizing and getting rid of things. It’s fun though! I think we have gone through three rooms so far. My Memommy has been coming to help us pack because she is such a great organizer. She comes on Fridays and spends all day with us. I think this Friday we are going to tackle the entertainment center, game closet, my mom’s desk, and maybe our bathroom. I really look forward to going through things. It helps us be one step closer to going to the Dominican Republic! Yay! We also have lots of events coming up. I’d like to name a few for you! The first is coming up this weekend. We have a horsemanship event for American Heritage Girls, then we are in our home school group talent show. At the end of next month, we have our first Craft Fair and Garage Sale. All the things that we have been going through get sold. My friends and I are making handmade items to sell at our Craft Fair. This is going to be so much fun! I’m asking all my friends to make some things and set up a booth at our house. We will have loom bracelets, cookies and lemonade, scarves, and much, much more! All the money goes to help us start everything up for the kids in the Dominican when we get there. Selling our items here in the garage sale will help us pay to get our other things down to the Dominican like our clothes and toys! We really aren’t taking much! In May, my sister and I are having our last birthday here in the States. We will be turning 11 years old. I think we are going to have a going away birthday party and ask all of our friends to come so that we can play and spend a lot of time together. Our theme for our birthday party this year is going to be a horse theme. We found some really neat things at Party City. We still need to go buy them. I’ve thought up some really cool games to play … pin the tail on the horse and do a skit from items that we find in a bag. My mom says hey to everyone!! She is really busy and acting a little crazy lately … at least that is what she says about herself! She has a lot to do before we leave, but we are all excited about leaving! So it’s 67 days from today that all will be done and we will be flying off to the Dominican Republic to show the love of Jesus Christ to those sweet little Haitian and Dominican kids there!! This entry was posted in Uncategorized on March 25, 2015 by wetransform365. God’s power, patience, and persistence is needed as we serve Him! Since our last update at the end of January, we have been running like crazy people…I know you all understand what that is like…life can pull us in every direction! But praise God that He doesn’t work on the same timetables we do, or view or daily lives as this cram it all in routine that actually often drives us away from Him. Even now, I am feeling the press as I type this…this morning has been filled with errands that needed to be accomplished before I leave town on a support raising journey to Texas for 9 days…trash dump (check), bank (check), post office (check), car washed (check), oh, and, um…pack!! And here I am..plane leaving at 1:30pm…anxious to get on the road but also excited to communicate with each of you about what God’s been up to over the last several weeks. On the support raising front, we will be between $5-6k in our monthly support needs by the time all of our Florida, DC area, and South Carolina friends come on board. God is doing this and bringing people to partner with us to accomplish His work to bless at risk children in the Dominican Republic…thank you for continuing to pray!! We’ve seen God meet needs from van repairs to unexpected special gifts of $1,000 and more. We’ve seen churches that are struggling themselves love on us and encourage us. We’ve had many, many friends help out with a bed to sleep in while Jeff’s on the road, and neighbors to help with taking care of the 4 downed trees from an ice storm back on Feb. 16th…there’s not enough room to mention every way that God has blessed but He is so good to take care of us through all the ups and downs…ins and outs…of life. Our feeding center went well on Feb. 21st as our Dominican friend, Gabby, is taking on a leadership role in overseeing the program for our special outreaches. 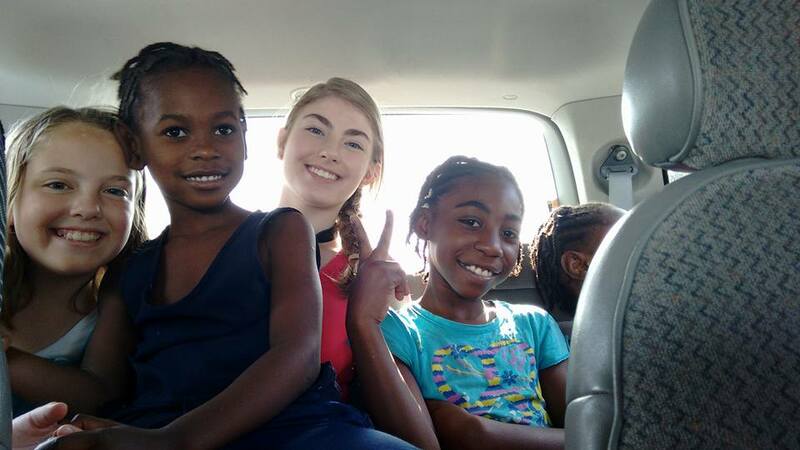 We’re so thankful that he has the heart our Father does…he doesn’t see Dominican & Haitian…he sees children in need and wants to love on them and point them to Jesus! God continues to grow His team to accomplish the mission!! 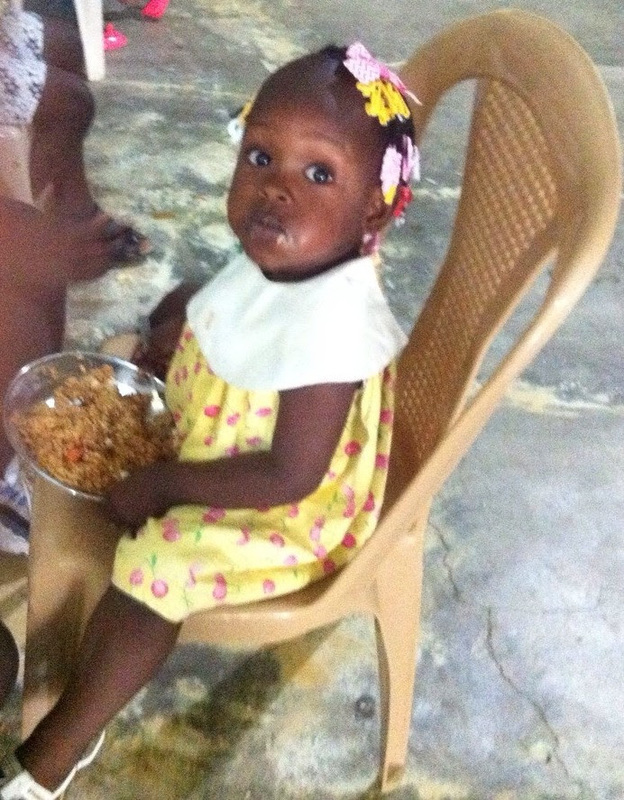 Below you will see a pic of one of our little Haitian girls that attends our feeding outreach in Arroyo Hondo…cute little girl! Keep praying for us as we have many support visits in several states over the next 6 weeks…Texas, South Carolina, Missouri, Colorado, Utah, Oregon, Washington, Vancouver – Canada, North Carolina, & of course, Georgia…pray for Jill and the girls while Jeff is gone on the road…for protection & God to meet every need! Pray we can close in on $8k per month in support by the end of March…end goal by June 1st is $10k. That covers the feeding center, establishing the rescue base, and our needs while in country. This entry was posted in Uncategorized on March 5, 2015 by wetransform365. Comfort & Warmth? Is that your status? This post might just knock you out of your comfort and warmth status if that is where you’re at right now. That seems to be where I am. I’m in my warm flannel plaid pants with my red Georgia sweatshirt on sitting in my hubby’s big comfy chair in a nice warm house watching an old English show. That sounds pretty desirable, doesn’t it? What is your status as you read this? Are you in the “provided for” status where someone older than you cares and provides for you, or perhaps you are in the “provide for” status where you provide for others. If you find yourself being provided for or being able to provide then you are in a much better place than those that God has called us to serve. As an adult, they don’t seem to find themselves with jobs to be able to provide for their family … most of the families we minister to are single parent homes. Sometimes it’s the dad leading and trying to care for the children and many times it is the mom and children left to fend for themselves. Then there are those who do not have a parent in their life to care for them at all. Another has to respond to the call of the Lord and reach out to these precious children. These children have no voice on their own. They are not able to walk downtown and represent themselves to the town mayor or speak up at a meeting saying I’m hungry and I have no one to love me. I’ve been cast off and not wanted or perhaps even worse, sold! Many times a child is sold because the parent is sold a false bill of goods. They have been told that if they give their child to this “benefactor” that their child will have schooling, food, clothes, and be given a good future making money. That does sound pretty good, does it not? So the parent decides that they are not able to give their child any of these things and it sounds that their child will be much better off with this person. The parent then releases the right to their own child and turns all rights over to this other person known as the child’s benefactor. They give all the child’s paperwork to the benefactor and say their good-bye’s. What have they done? Most times they have no idea. They have just sold their precious child into human trafficking. They most likely will never see this child again. The child will never be the same again. All innocence taken from them and only left with deep wounds and scars. What happened to the wealth, clothes, and schooling that was promised? It was a lie! God has called the Jones family to be a voice, an advocate for these children whom God loves and adores who have no voice and no one to speak for them. He has called us to be a mother & father to the motherless and fatherless and to feed those physically in Jesus name who have no food. He has called us to come alongside that mother who wants to care for her sweet little girls, but has no schooling or training herself and teach her. Praise God!! 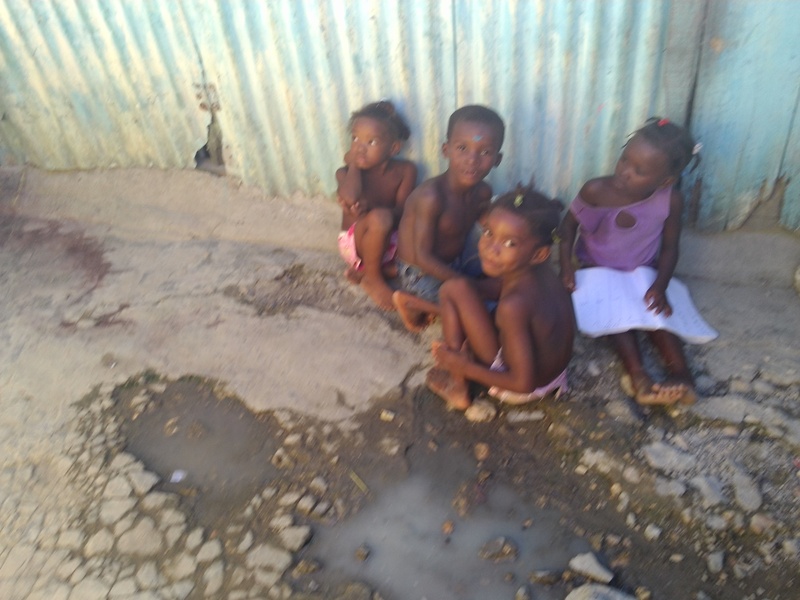 He has called us to provide schooling for these kids who are not in school and every day tell them Jesus loves them! Do you know what is so special about this, we don’t just get to tell them. We get to show them!! Amen! Is that not what Jesus did in the New Testament? He loved people, He met physical needs, He preached the gospel. He didn’t just preach, but reached down in their need and showed them that He loved them. We are sooooo excited to be going this June to answer the call that Jesus has so greatly impressed upon our hearts. Our hearts are full and overflowing with the love of Jesus Christ. We get the privilege of serving these precious little ones. What an honor!! As Americans, we think that we are going to bless these people or children, but no it is you and I that receive the blessing. This past summer we were in the Dominican Republic, my cup was overflowing every day. Praise the Lord! Just being able to help in some small way, to see these kids sweet faces and receive their love and hugs. Priceless! After this post, don’t you just want to drop all and come on down? That is how I feel from reading this. That is how we have been feeling for almost the past three years waiting for the Lord’s timing to provide the funding needed to care for these kiddos. We are getting so close as we are halfway there. We only need 50% more each month in support to be able to have the feeding center up and operational 5 days a week feeding the 200 children already enrolled in the program and to start the first cottage of the rescue base. This will house a set of house parents and up to 6-8 children. We have already identified children from this past summer’s work that need to be cared for at the cottage. Will you come join us or will you help send us? It takes all of us. We all have a calling either to send or go! What is your calling? We love all of you and look so forward to seeing you in the Dominican Republic or hearing how you are praying for these children and us! We need your prayers! We must stay on the road that God has called and not be pulled off. We need wisdom and understanding beyond what we know. We need His wisdom! This entry was posted in Uncategorized on February 11, 2015 by wetransform365. Hey My Sweet Praying Friends!! What a blessing you are! You know, we can’t do it without you! All those prayers are so vitally important to every facet of God’s work. He loves for us to talk to Him. I don’t know how He does it … I only have three girls and believe me they all try and talk at the same time. It’s chaos!!! I have to take a time out! I say ALRIGHT! Mommy needs a five minute time out to just readjust my brain. I can’t process all that you are trying to put in it!!!! Wew! I’m on overload and yet the Lord says in His Word for us to please make petitions in His name daily, moment by moment. Wow! We know that we serve an awesome God to be able to hear all those requests and conversations at the same time! So keep those prayers going! Lol! We need them! I wanted to give ya’ll a little update! As Jeff stated in his last post, we all five went on the last 10 day trip together as a family. It truly was amazing! Jeff met my friends that he had never met before, I met friends of his I’d never met before. We both met spouses and children of friends that we haven’t seen in 20 or 30 years since high school and college. Now, you know this is the Lord when you haven’t seen people in this long haven’t even met half their family yet upon arrival hug and embrace, sit down and pick up a conversation as if there was no time gap. Now I’m just saying … that’s God! We had so much fun sharing our excitement and passion with everyone. There were days that Jeff, myself, and girls shared the wonderful message of what God has called us to as many as five or six times a day. And if we talked to multiple people at a church or group then it was more than that. It was exhausting and amazing all at the same time. Really to sum up our trip in one word I’d have to say BEAUTIFUL! Why? Because we saw the hand of the Lord in our lives and others lives multiple times a day! Just for example, in one stop we met a pastor who knew a man in the Dominican that Jeff met over two years ago and lost touch with. He put us back in touch with each other. At that same stop, we met a man who has contacts with a lawyer in the DR and hopefully can help us get our residency for a fraction of the cost that we were quoted. This same man loved to hear the direction the Lord was leading us in and wants to participate in the micro-loan program as well as helping us set up a business plan for Haitians and Dominicans to begin learning how to provide for their families. That church also took us on for support! Praise the Lord!! It was a sweet and amazing time. One that brings tears to my eyes as I type and think back on each circumstance. How you can talk to Jesus about His work!? If you would pray for Jeff right now as he travels from meeting to meeting. He started in Baltimore, Maryland on Saturday and today, Thursday, is in Florida. He has spent the night in a different spot each evening. He doesn’t seem to mind. He so grateful for each place he has to lay his head. I on the other hand would be going crazy. I’m very thankful that the girls and me are home on this trip. 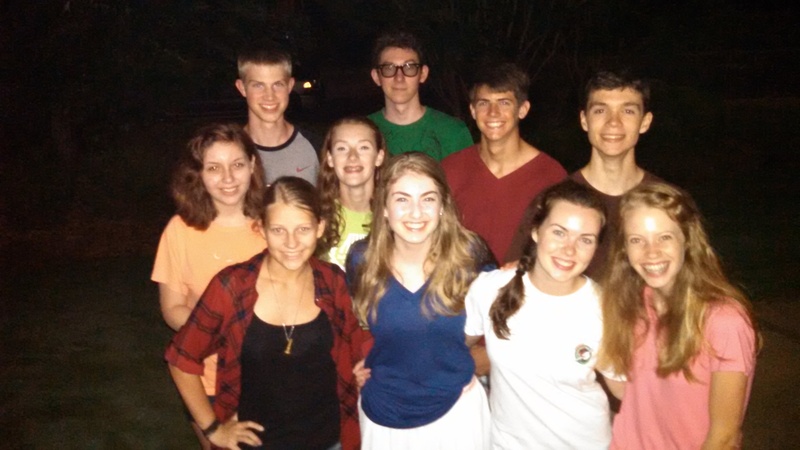 However, I do miss being with everyone. Trying to do home school and be at a different spot each day would be challenging for us. So, Jeff is on his own with this trip. He is sick right now. He has picked up a germ somewhere along the line. So prayers for him as he snoots on everyone. Lol! Not too fun when your eyes and nose are running and you are sneezing everywhere. Not too many people want to be around a snooty patooty! He has to tough it out until next Wednesday, Feb. 4th. Pray that the Lord gives him strength and dries up the faucet while he is in the meetings and that the Lord adds to the team all those that He has planned to join! It takes a village, right!! Love ya’ll and thank you so much for reading! Talk to you again soon! This entry was posted in Uncategorized on January 30, 2015 by wetransform365.